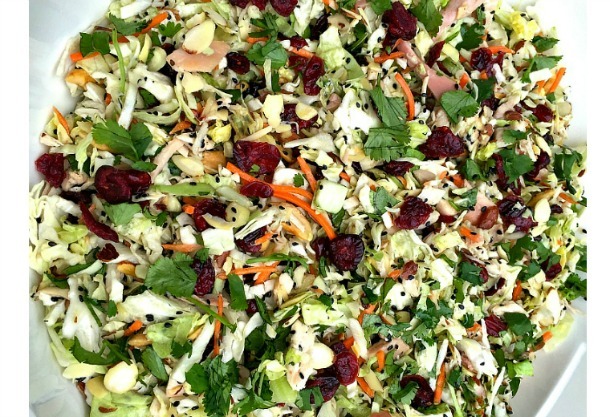 Today’s WINNING recipe to meet Coach JC’s 10 WINNING Habits is Asian Chicken Cranberry Salad. Where are my veggies? Where is my lean protein? 1. Layer the cabbage in a large bowl with chicken, almonds, cranberries, red onion, sesame seeds, sesame sticks (optional) and fresh cilantro. 2. Combine the olive oil, balsamic vinegar, soy sauce, garlic, honey, ginger, and sesame oil in a blender. Add 2 tablespoons of water. Process until smooth. 3. Lightly pour the dressing over the salad mixture and toss.